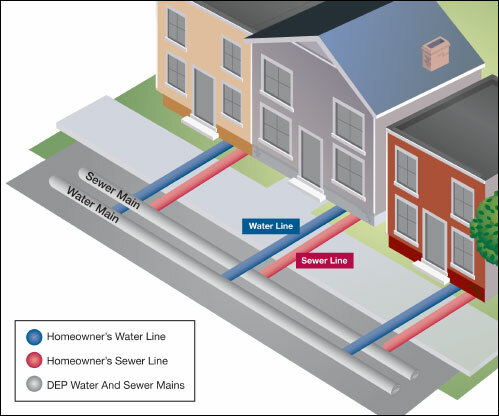 DEP is pleased to announce that we have collaborated with American Water Resources (AWR) to offer a Water and Sewer Service Line Protection Program to our customers. This voluntary program is designed to protect New York City homeowners from the unexpected costs of service line repairs. Most homeowners are not aware that they are responsible for all of the costs associated with repairing damaged water or sewer service lines that run from their building’s exterior to the municipal service lines in the street. These repairs are not covered by most homeowners insurance policies and can cost thousands of dollars. AWR has been selected as the exclusive provider of the Water and Sewer Service Line Protection Programs for DEP customers. As a homeowner and DEP customer, you can enroll in the protection programs, and AWR will take the responsibility of paying for service line repairs off your shoulders. There are certain situations and infrastructure conditions that will prevent AWR from providing service. As always, it’s important review AWR’s contract carefully. Starting July 1, 2016 rates of $4.49 per month for water line protection and $8.47 per month for sewer line protection will be offered. The New York City Water Board will adopt the annual rates for the Programs along with regular water and sewer service charges. These charges will be included in your DEP water and sewer bill and must be paid to remain eligible. For more information about the Water and Sewer Service Line Protection Program, call AWR toll-free at (888) 300-3570 or click here. *Properties that are not residential, are not metered, have multiple service lines, are not equipped with a wireless meter reading device, are more than $500 and 180 days delinquent on charges, are not up-to-date in an existing payment agreement, are billed on a frontage fire line plan, or are served by a meter pipe of greater than 2" are not eligible.